Network teams are faced with a race to build out data center network capacity and to effectively provision connectivity at an increasing speed. To keep pace, IT organizations need a network architecture that is more coherent, flexible, and agile. But they don’t want to give up the stability, high availability, and security offered by the proven compute and storage networks currently installed in their data centers. With FlexFabric, HP is creating a new balance by combining the best standards-based networking technologies with a new modular architecture that optimizes the full range of virtualization capabilities while meeting business requirements for both low total cost of ownership, faster time-to-service, and critical requirements for IT governance and compliance. 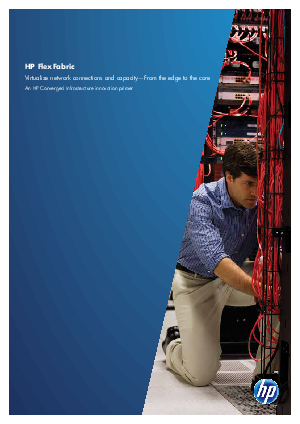 Read this whitepaper to learn how HP FlexFabric can provision your network resources efficiently and securely to accelerate deployment of virtualized workloads.